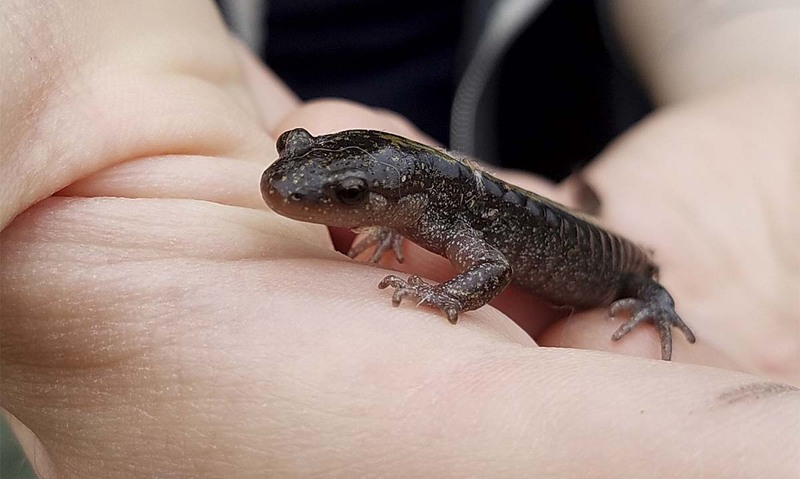 VANCOUVER — Area residents can make Sat., April 13, the day to discover and explore hopping and crawling critters as Vancouver’s Water Resources Education Center celebrates its 19th annual Critter Count with an outside search for cold-blooded creatures in the morning and special Second Saturday reptile shows in the afternoon. Come help with field surveys of amphibians and reptiles at local natural areas. Critter Count begins at 9 a.m. at the Water Center, 4600 SE Columbia Way, with a brief training session conducted by a wildlife biologist from the Northwest Ecological Research Institute. Participants will get a quick overview of the identification of local frogs, snakes, salamanders, lizards, and other amphibians and reptiles. Then all critter counters will venture out to one of four sites to find and document amphibians and reptiles in their habitats. A wildlife expert and a site coordinator will be on hand at each location to help. Frogs and other amphibians are extremely sensitive to water quality and changing environmental conditions. Keeping track of the numbers provides a better understanding of the challenges they are facing, and data gathered during Critter Count are made available to management agencies. Participants must provide their own transportation to field sites. For a great experience, please come equipped with boots, warm clothes, a lunch and, if possible, binoculars. Training, field guidebooks, equipment, snacks and water will be provided. All ages are welcome to participate, but children must be accompanied throughout the survey by adults. At least one adult chaperone is required for every three students in grades 3-8. For younger ages, please have a minimum of one adult chaperone per child. Critter fun forges ahead in the afternoon, when visitors have an opportunity to get a close-up view of snakes, lizards and other reptiles. The Water Center welcomes Creature Feature with two live critter shows, at 1 p.m. and again at 2 p.m. Learn fascinating facts about reptiles and find out how you can become a “herp hero” with simple actions that protect water and critters. This special Second Saturday Earth-month celebration is designed to be family-friendly and fun. Note: Children must be accompanied by a parent or guardian. Admission to the Water Center and reptile shows is free! Critter Count is a partnership of the city of Vancouver’s Water Resources Education Center; US Fish and Wildlife, Ridgefield; Columbia Springs; CASEE Center, a program of the Battle Ground School District; and the Northwest Ecological Research Institute. For additional information about Critter Count and the Critter Shows on Sat., April 13, call (360) 487-7111 or click here to visit the Critter Count page on the Water Center’s website. You can also learn about other events on the website at www.cityofvancouver.us/watercenter. The Water Center’s general hours are 9 a.m. to 5 p.m., Mondays through Friday, and noon to 5 p.m. on Saturdays. From Interstate 5 or Interstate 205, take state Highway 14 to Exit 1. Turn south under the highway, then east at the Columbia Shores intersection onto Columbia Way and head east about 3 miles to the Water Center. More information is available on the Internet at www.cityofvancouver.us/watercenter or by calling (360) 487-7111.